Soo let’s talk about breakfast. We all know that breakfast is the most important meal of the day as it kick starts our metabolism, provides us with the necessary energy and fuel for active brain function and really sets the tone for the rest of the day. I don’t know about you, but when I actually take the time to make myself a healthy breakfast, I usually don’t want to eat crap for lunch and dinner – plus I just FEEL better! Ok well herein lies the problem…..I am NOT a morning person. Um the struggle is REAL folks. Like we’re talking hit the snooze button at least 5 times. Most mornings my routine is to get up, make breakfast for my husband and myself, get him out the door to work and then I stroll into my home office and get to work! Most mornings breakfast is eggs with some fruit (and if we’re both lucky) I will even cook some quinoa the night before and get some carbs in there for us too! However, there are a few days a week my honey needs to get out the door SUPER EARLY!! And this girl sometimes needs help from a little secret weapon called PLANNING to help make mornings run a little smoother!! QUE THE ANGELS SIGNING…AHHHHH!!! 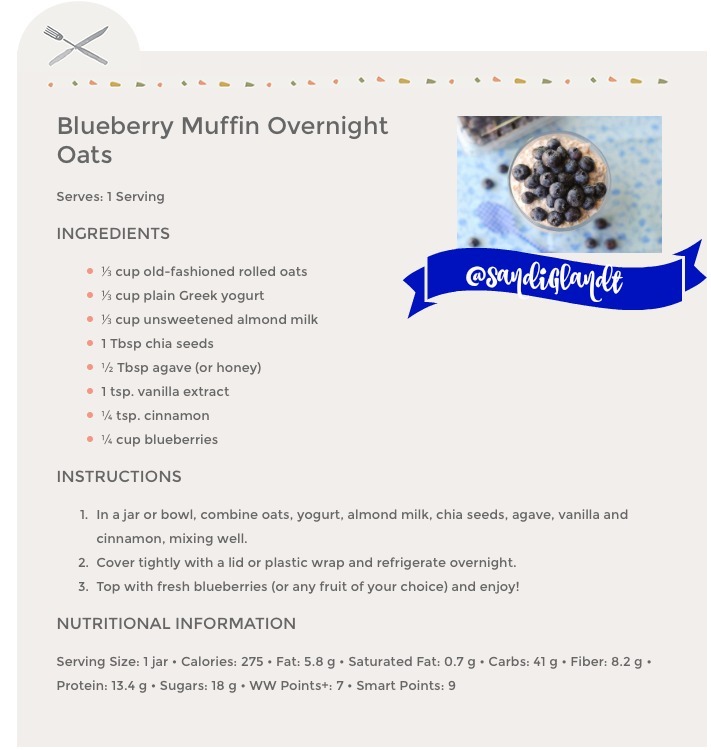 Thank you OVERNIGHT OATS!!! And the best part?? Yep, (just like in their name) they can be made the night before in under 5 minutes. Now you’re speaking my love language! This is really so simple to make yet so incredibly healthy for you being high in protein and fiber – it’s a win win! 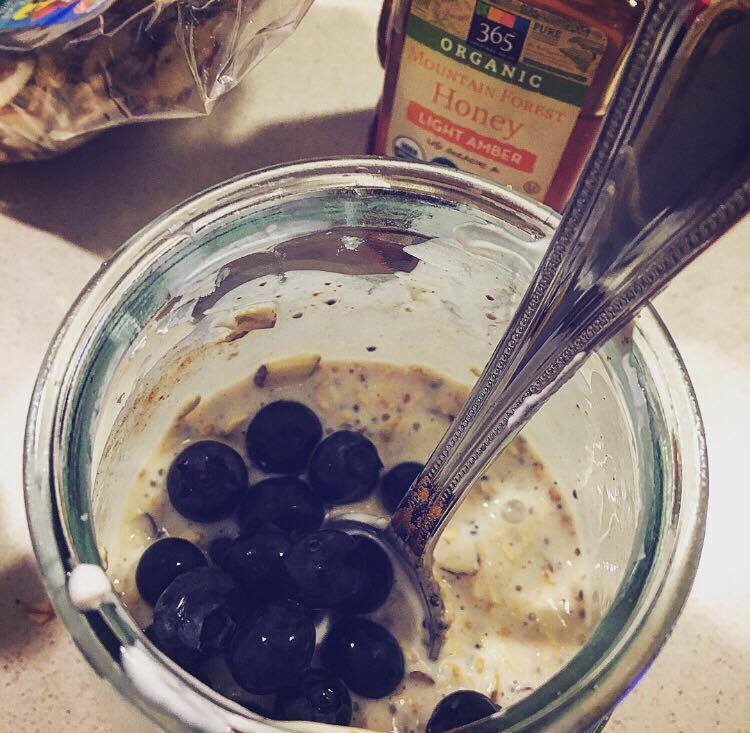 Now I like my overnight oats lightly sweetened and I think the agave, vanilla, cinnamon and blueberries are the perfect combo for just that, however if this recipe is still too bland for you, feel free to add in a pinch of Stevia, a little extra agave/honey or even a little brown sugar. 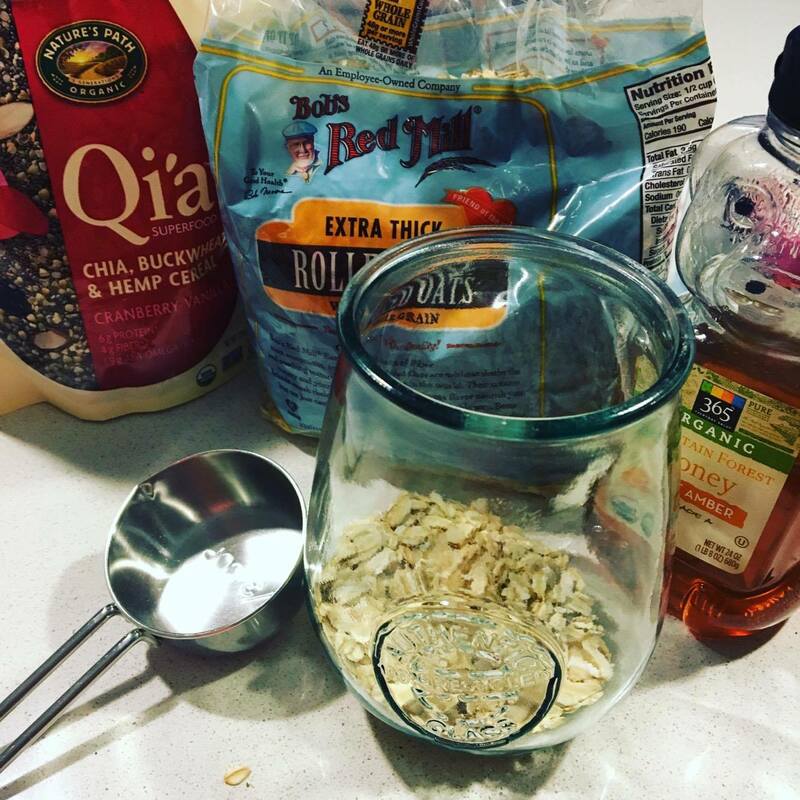 Unlike hot oatmeal, cold oats that have been soaking overnight tend to lose much of their flavor so you really do need to add some sweetness, but the great thing is they are SO creamy the next day! I mean what’s not to love?? The other great thing about this recipe is that it is so easy to play around with! Not a fan of blueberries? Swap in some peanut butter and bananas or even rapberries with honey. The possibilities are truly endless and it’s pretty fun to mix things up. The basic recipe for overnight oats is equal parts rolled oats, milk and yogurt then adding in your seeds, sweeteners and fruit. BOOM – a delicious breakfast that will keep your tummy satisfied all morning long, making you less likely to eat that unhealthy lunch later in the day. So keep on hitting that snooze button and enjoy sleeping in those extra 10 minutes because I promise you these overnight oats are worth making. Yes you’re welcome!